THE HERO stars the legendary Sam Elliott as an aging actor confronting mortality in the moving new film from writer/director Brett Haley (I’LL SEE YOU IN MY DREAMS). Lee Hayden (Elliott) is a Western icon with a golden voice, but his best performances are decades behind him. He spends his days reliving old glories and smoking too much weed with his former-co-star-turned-dealer, Jeremy (Nick Offerman), until a surprise cancer diagnosis brings his priorities into sharp focus. He soon strikes up an exciting, contentious relationship with stand-up comic Charlotte (Laura Prepon), and he attempts to reconnect with his estranged daughter, Lucy (Krysten Ritter), all while searching for one final role to cement his legacy. THE HERO is a beautiful and poignant celebration of life and the legacies we all leave behind. 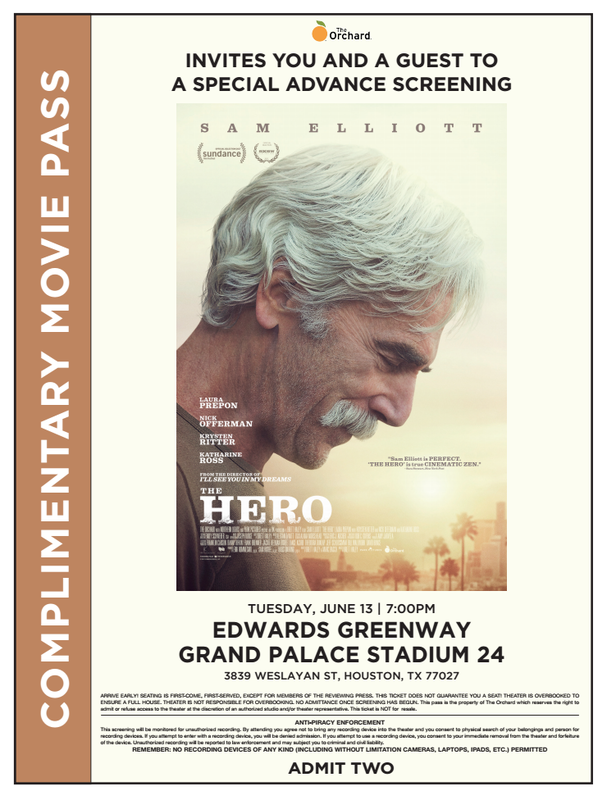 Click on the movie pass below and print a copy to bring to the theater to attend the screening of The Hero on Tuesday, June 13th at 7:00PM. The movie will be at Edwards Greenway Grand Palace Stadium 24 in Houston. You must have a copy of this pass printed out, if not you will not get access. There is no clickable link, all you must do is print what you see below. Thanks!! !